It's all about the music. Looking ahead a few months, jump starting the 5th Annual Carolina Jazz Concert Series hosted by the Jazz Diva in Charlotte, NC will be Najee and Alex Bugnon on August 3rd at the Halton Theater. The second concert in the series will be headlined by Take 6 on September 28th at the Halton Theater. The season will end with a “MUST SEE” concert featuring Johnathan Butler on November 2nd at the Halton Theater. Tickets can be purchased for these shows at http://tix.cpcc.edu/events/carolina_jazz_concert_series or by calling 704-330-6534. Tickets go on sale on February 15th. There are many concerts to attend this year. 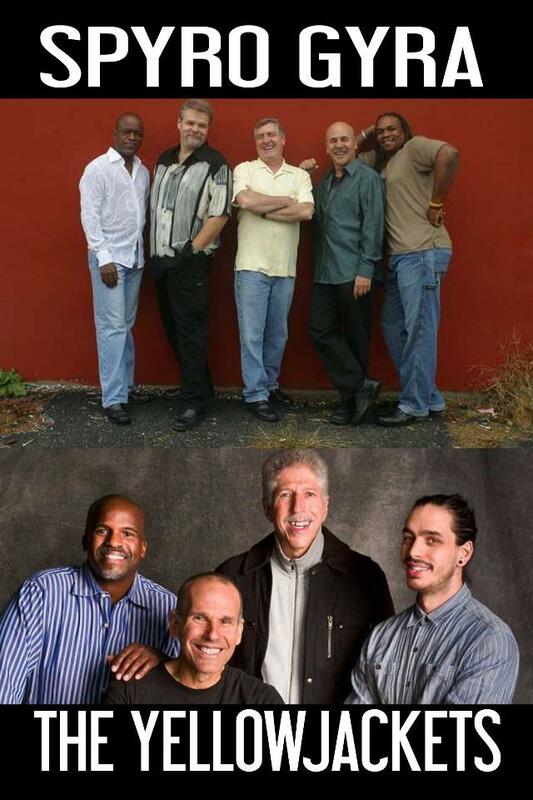 However, I must admit that I’m so excited to end the year with one very special evening with Spyro Gyra and The Yellowjackets on December 14th at 8:00pm. The show will be held at The Knight Theater in Charlotte, NC. Tickets can be purchased at www.carolinatix.org, or by calling the box office at 704-372-1000. They are 2 of my all time favorite jazz bands that I’ve loved and listened to for many years. It’s like the best Christmas gift I could have received. Thanks to the Jazz Diva Tammy Greene for making this happen. You don’t want to miss this opportunity to see them perform live. I can personally attest to that. I’m back home from Seabreeze, and the very next day(April 21st) I go see Boney James again at the Knight Theater. Another sold out Jazz Diva show. Buff Dillard opened the show and did a great job. Hopefully, you would have had the pleasure of seeing Boney perform live. If not, do yourself a favor and catch his show either in your city or a city nearby. You won’t regret it. Boney is not only a bad boy on the saxophone, but he is an entertainer. He’ll have you singing, snapping your fingers, waving your hands in the air, and on your feet dancing as he makes his signature moves through the crowd. You’ll leave mesmerized and exhilarated. Whew! What a music filled week it’s been. On Tuesday April 30th, Hidden Beach Recording Artist Jeff Bradshaw performs at Club Label. Click below to see Omari William’s drum solo on “The Beat” Tour with Boney James in Charlotte, NC. I’ve added a new Jazzfest to my list this year. The 15th annual Seabreeze Jazzfest in Panama City, Fl. As a matter of fact, I’m sitting in the airport on my way there now. After hearing nothing but things about Seabreeze I couldn’t wait to experience it for myself. That’s exactly what I did. Panama City, FL is a lovely beach city. The water is blue and the sand is white. The Jazzfest which is held at Pier Park debuted a new ampitheater this year, and Seabreeze was the first to show they had. With an estimated 7500 people in attendance, it was clear that this was definitely the place to be. Starting on Wednesday guest could enjoy a cruise with the one and only Brian Culbertson. 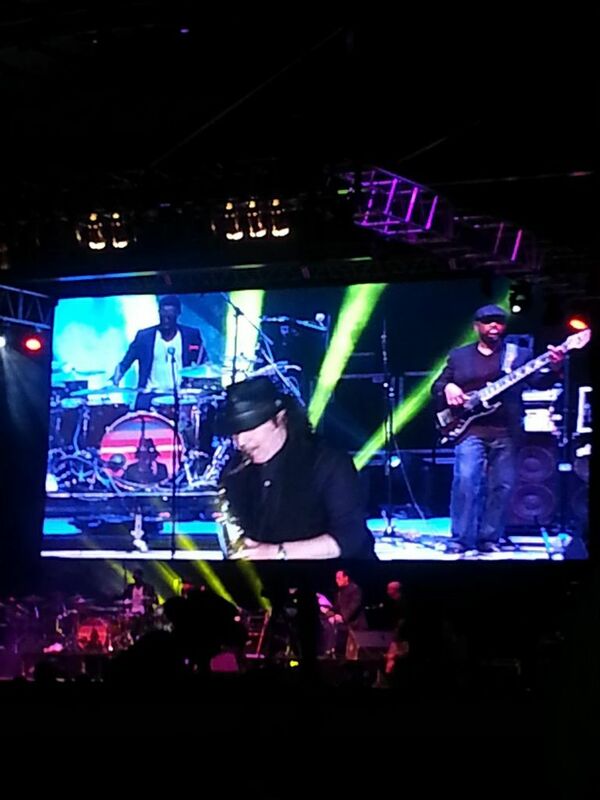 Thursday the line-up was Steve Oliver, MargoRey, and headlining was none other than Boney James. Debuting his new album “The Beat” as well as mesmerizing us with older tunes. As night came upon us, we were all on our feet grooving with Boney. Friday’s line-up was Ken Ford, Tim Bowman, ending the night was the phenomenal Fourplay with special guest Lalah Hathaway. Saturday is the longest day of entertainment. Beginning with Brian Lenair, DW3, Euge Groove, Peter White, PeetProject, Brian Culbertson, BWB(Norman Brown, Kirk Whalum, and Rick Braun). The week ended on Sunday with Roman Street, The Southern Gentelmen, Yancy, Average White Band, Jazz in Pink, and closed with Tower of Power. The dates for next year are April 23-27, 2014. Make your plans now to attend. Get all the information you need by going to www.seabreezejazzfestival.com. Hopefully I’ll see you there. In 2012 I attended the Sunset Jazzfest in Atlanta, Ga for the first time. It was definitely 1 of my top 2 concerts of 2012. Chastain Park Ampitheater is the beautiful venue for Sunset. 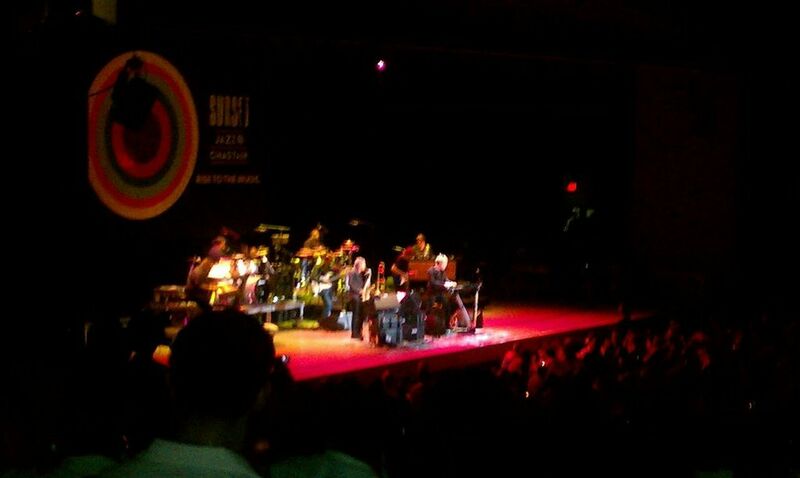 The highlight of last year’s show was David Sanborn with Brian Culbertson. This year they have added an additional night to the lineup. The dates are August 16-17, 2013. You can expect to be submerged in music coming from such artist as Will Downing, Najee, Hiroshima, and Rachelle Ferrell just to name a few. For ticket information, visit www.deltaclassicchastain.com. I’ll be going back this year and am so excited. Now I’m all grown up and even more immersed in music. I never miss an opportunity to enjoy good music. I’ve spent the last 2 years attending concerts in different cities. Enjoying different jazzfests has become one of my favorite things to do. One of my favorites is the Uptown Charlotte Jazzfest in Charlotte, NC. I’ve attended the past 3 years since they began. 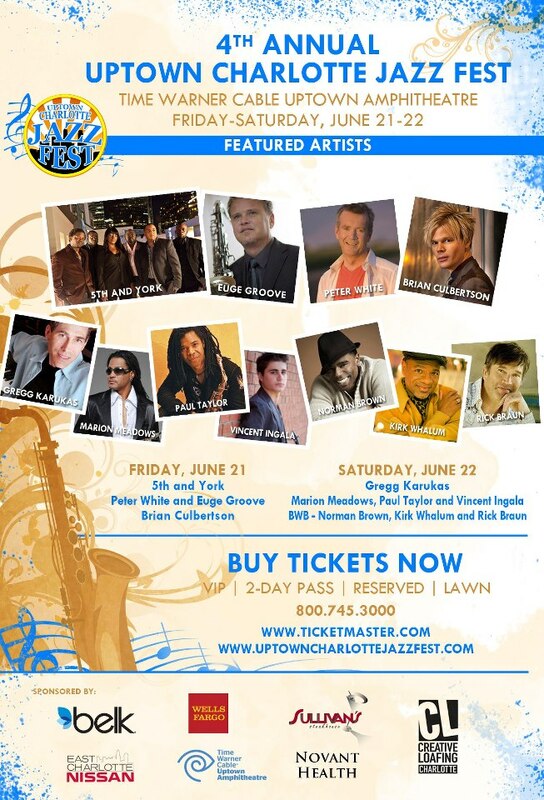 The 4th Annual Uptown Charlotte Jazzfest is scheduled for June 21-22, 2013 at the Time Warner Cable Uptown Ampitheater. The line-up is as follows. Friday, Charlotte’s own 5th and York, Euge Groove, Peter White, and headlining will be Brian Culbertson Official. On Saturday, there’s Gregg Karukas Keyboardist/Composer, Marion Meadows, Paul Taylor, Vincent Ingala(Smooth Jazz Artist), and finishing out the fest will be BWB(Norman Brown, Kirk Whalum, Rick Braun). It’s become one I don’t ever intend to miss and neither should you. Tammy Greene aka the Jazz Diva is one of the most well-known and respected promoters of fine jazz concerts in the area. Along with the Uptown Charlotte Jazzfest, Tammy hosts concerts all year long. She’s also the diva behind the Lowcountry Jazz Festival in Charleston, SC, which is August 30-Sept 1, 2013. For more information, visit www.lowcountryjazzfestival.com. You can follow her on twitter @JazzDiva, on facebook The Jazz Diva, and at http://www.jazzdivaevents.com to get all the latest information. I’ve spent many years indulging in the musicality of many great musicians. As a child my Mother would play artists like Noel Pointer, David Sanborn, Bob James, Miles Davis, and Bob Marley just to name a few. So I grew up listening to the best. 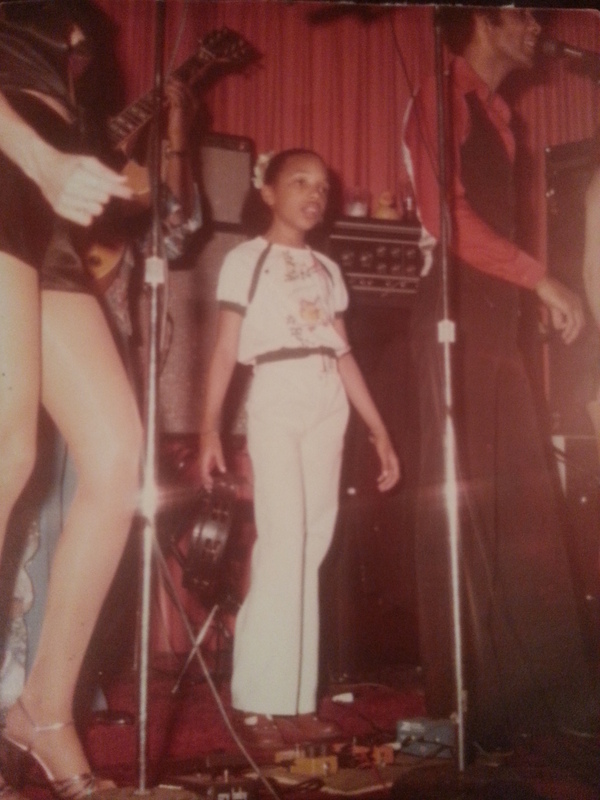 Traveling with my Father and his band as a young girl I was constantly in the presence of great vocalists and musicians. Not only did I travel with him, but I would always be on stage doing the dance moves and singing behind the main vocalists. The stage has always felt like home to me. I love it! Being on the road exposed me to all genres of music. My Father who has sung with such great artists such as the Temptations, Impressions, Percy Sledge, Clarence Carter, The Beach Boys, Glen Campbell, Diane Ross and the Supremes, The Manhattans, Little Richard, Chubby Checker, The Platters, The Drifters, Jackie Wilson, Alabama, and many more. Over 20 years ago while traveling and singing during my college breaks with my Father’s band, I really became immersed in all types of music. Motown, beach music, 60’s and 70’s era, funk, and everything in between. When not on the road, I attended a variety of concerts from Michael Jackson, to Prince , to Yellow Jackets, and Wynton Marsalis. My musical palette is very diverse. Choose the way you fly! We all relate to the healing power of music.